This is the story of how I spent most of my afternoon at Nebraska Furniture Mart (NFM) and ended up buying a nice new camera for 11% of its actual cost. I wrote yesterday about mom and I going to the zoo. I’m not a great photographer, but that doesn’t stop me from loving photography, which is why I made sure I had my camera with me. We had been through the aquarium and the butterfly pavilion, and my camera was working fine. We went and watched an IMAX film (if you have a zoo membership, you get into the IMAX for free), and then headed for the cat complex. When we were inside the building, I got my camera out, and turned it on. I noticed two blue streaks in the upper left hand corner of my display. I’d never had anything show up like this, so I turned the camera off, waited, and turned it back on. Blue smudge streaks were still there. The camera still worked, but I was concerned that this might be a sign of future problems. Today, the blue smudges were still there, so I finally called NFM customer service to speak with them about it. There were two reasons for this. A: I head back to ND on Sunday, and I’m running out of time to take care of things here at home. If the blue smudge streaks were a omen of something truly going wrong with my camera, I wanted to be able to take care of it right away, instead of having to wait months before being able to get to NFM. B: Two years ago I purchased this camera from the NFM clearance. It was the exact same camera as the top of the line they had out on the sales floor, it had just been a display camera and due to that they couldn’t sell it as new. It was in great condition, and had so much more to offer than my little Coolpix I had bought back in 2004. When I purchased this one in 2010, I got a 3-year accidental warranty policy. I know some people say warranties are a rip-off, but I really liked the idea that if something bad happened, they’d fix it or replace it. Besides, when I divided the warranty price out over the three years, it was a pretty cheap price to pay for a repair or replacement. So, I called and after explaining the situation and giving my information, the guy I spoke with told me that I had to options. They could either mail me a check for what I originally spent on the camera, or issue me store credit so that I could come in and pick out a replacement. I asked if it would be possible to just get my camera fixed, and to my surprise, I was told that since what I paid was under their limit (which if it had been new when I bought it, instead of a floor model, it would’ve been over their limit), they wouldn’t repair it. I decided to go with the option of getting a new camera, which meant dad and I headed off on an adventure to NFM. 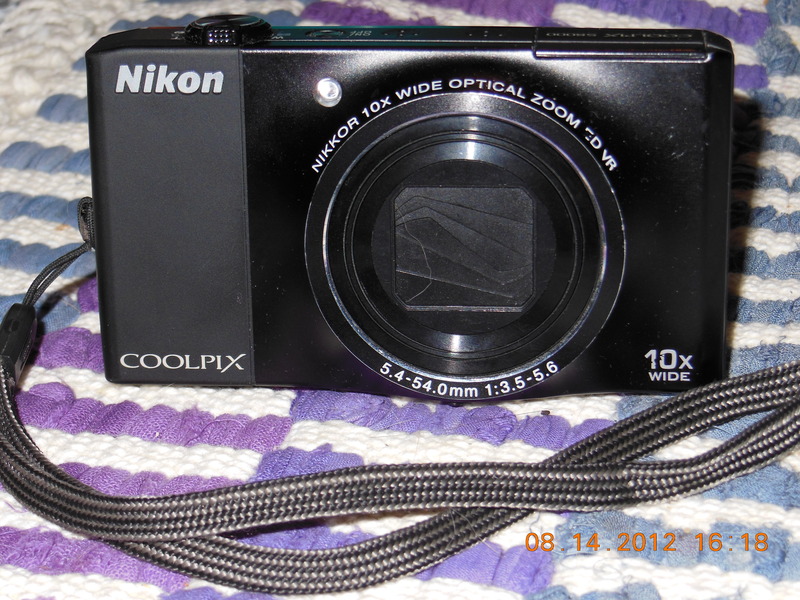 Like the one I purchased two years ago, this one is the most recent version of Coolpix, and it had also been a floor model. After checking the information and playing around with the current one on display, I decided this was the camera. It was meant to be. Plus, since it was a former display camera, the price was really low, and with the store credit, it was going to cost me less that $40 out of my own pocket to get. While finishing up buying it, the customer service rep, took it out of the box, so I could make sure it was okay. Since the battery was dead, I couldn’t turn it on, but it appeared to be okay. When we got home, I got ready to play with my new toy. I was really excited. I pulled the battery from my other camera and put it in the new one (they both use the same battery, it’s really handy). I turned on the camera, and it clicked on, but then gave me an error message about the dial mode not being in position, and turned itself off. I tried it again, and got the same message. This time I looked closer, and discovered that the plate on top had gotten out of position, and the dial was sitting slightly cockeyed. Dismayed, I tried, and dad tried, to get the plate to click back in, but it was stubborn. So, back to NFM we went. I was really worried that they’d not want to work with me since I was having so much camera drama, and that the customer service people would be really rude. My worries were completely pointless. A different lady helped us, and when she saw what the problem was, she assured us it wasn’t a problem, and said I could go find a different camera and we’d redo the process from earlier. I found another camera that was the exact same one I wanted that was also in clearance, but they wanted fifty dollars more for it. I just didn’t have the extra, so I settled on another Nikon, that was really nice, but not as great as the one I’d picked. I told myself that my other camera was still in pretty good condition, and apart from those blue smudge streaks, it was still a nice camera that took good pictures. Going back to customer service, I was surprised when the really nice lady showed me that she’d managed to get the plate down, and the camera was working perfectly. Overjoyed, I let dad take the lesser camera back, and I set about finishing up at customer service. The rep told me that it was a really nice camera, and she had a Canon that she loved, but she really liked this one too. She then started talking about how she’d taken her camera with her to her granddaughter’s funeral, and she’d gotten some pictures that she was sure her son and his wife would want some day, but their hearts needed time to heal. At this point dad returned, and overhearing what she was saying (but not who had passed away), he asked if she’d lost someone. To this she replied that she’d lost her 3-day old granddaughter. She said that she would’ve liked for her to live to be over a hundred, but Jesus had needed her. She started talking about how good God is, and how much He loved us all. I was in shock. She was so sweet, and so genuine. I could tell she wasn’t just saying these things because they sounded good. She really believed it. I’m a Christian, and I was just blown away by how much peace this woman had about what had happened. All in all, it was a pretty amazing afternoon. I got a beautiful new camera, and it’s a Nikon. (I grew up in a Nikon loving household. I don’t have anything against Canon, or other brands, but I really love my Nikons.) On top of this, I saw someone totally living their faith and standing strong in it. Also, most amazing customer service I have ever experienced! I dealt with five different people this afternoon, and they were all consistently friendly, courteous, and just plain awesome!